A pond heater allows fish to overwinter in their outdoor pond by ensuring a hole is maintained in the ice for exhausting gasses from the pond. Pond heaters operate with built-in thermostats to melt a small hole in the ice for low electrical costs. Maintaining a hole in the ice ensures the pond does not freeze solid in cold Canadian climates. Goldfish and koi can survive outside in most ponds if they are properly winterized and a pond heater is an essential tool. The 100 Watt ThermoPond heater is ideal for smaller water gardens and backyard ponds up to 500 gallons. The Perfect Climate pond heaters will keep a larger area open in the ice and are best for larger ponds. Multiple heaters can be used in bigger basins. The open area created by the heater can be used to introduce a bubbler diffuser via a small air pump into a pond to add aeration during the long winter and to ensure that ammonia levels to not build up. The Atlantic® 300 Watt De-Icer has a small LED light to indicate it is functioning, the blue glowing light indicates it is in standby mode and turns green when it is heating. This allows you to know for sure your heater is working. The heater is thermostatically controlled so it only turns on eno..
Energy efficient, thermostatically controlled, safe in all ponds these de-icer and heaters are great for Canadian fish ponds and the harsh winters here in Canada. K & H 100W Thermo-Pond™ Heater Thermostatically controlled, safe in all ponds and carry a 1 year warranty. The class..
Energy efficient, thermostatically controlled, safe in all ponds these de-icer and heaters are great for Canadian fish ponds and the harsh winters here in Canada. 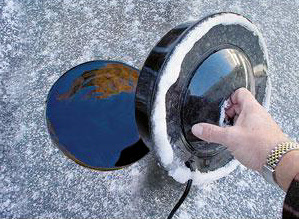 Can be used as a floating heater or a submersed heater by removing the floating foam bouyancy ring. Perfect Climate™ Deluxe Pond ..
Energy efficient, thermostatically controlled, safe in all ponds these de-icer and heaters are great for Canadian fish ponds and the harsh winters here in Canada. Free Shipping. Aquascape stainless steel Pond De-Icer is ideal for keeping a small hole opening the ice during cold winter months..